Bridge projects in three states show how the Highways for LIFE program is encouraging a wide range of innovations that speed construction, improve quality and enhance safety for the traveling public and construction workers alike. In Oregon, construction is being accelerated by building two new bridges away from traffic, then sliding them into place on the existing alignment. Innovative contracting methods are working in South Carolina, and precast concrete deck slabs are speeding construction on two bridges in Maryland. Accelerated bridge construction techniques are resulting in dramatic reductions in the construction schedule for five bridges on an 11-mile (17.7-kilometer) stretch of Oregon Highway 38. 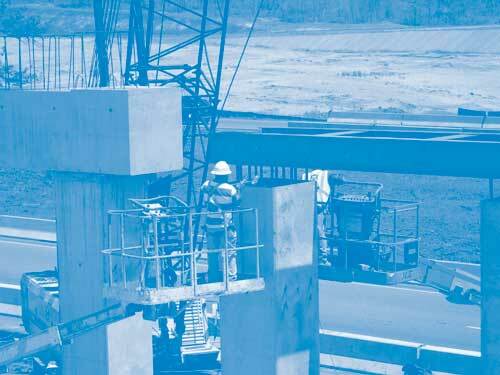 Slayden Construction Co. of Stayton, Ore., began work on the $52 million contract in spring 2007. The contractor, which plans to complete the project in December, is running 10 months ahead of schedule, said Steve Narkiewicz, project manager for the Oregon Department of Transportation. For its innovations and accelerated techniques on the project, the Oregon DOT was awarded a $1 million grant from the Highways for LIFE program. Two bridges-located at each end of Elk Creek Tunnel in Elk Creek State Park-present extremely difficult site conditions. At the east end of the tunnel, only 30 feet (9.1 meters) separate the tunnel portal and the bridge abutment. At the tunnel's west end, that separation is 170 feet (51.8 meters). For staged construction, the transitions from the tunnel to the temporary roadway during construction would have been nearly impossible. The approach was to build the new bridge superstructures on temporary piers adjacent to the existing structures. One is a two-span structure with precast concrete beams, while the other is a three-span bridge with steel girders. While the new superstructures were being built, the existing bridges stayed in place to carry traffic. In the Oregon project, accelerated bridge construction techniques dramatically cut construction time. Meanwhile, the contractor installed drilled-shaft foundations, columns and pier caps for the two new bridges under the old bridges. On the opposite side of the new bridge, the contractor built another set of temporary piers. Then, in a one-weekend closure, the contractor planned to cut loose the existing bridge from its supports, jack it over onto the temporary supports, and slide the new bridge into place on its new pier caps. That way, traffic impact was confined to one weekend instead of two years under a staged approach. With staged construction, one lane would have been closed while another remained open to traffic. That approach would have been difficult because of the narrow tunnel opening and short distances separating the tunnel portals from the existing bridges, said Ron Reisdorf, senior construction engineer for the Oregon DOT. The use of the design-build contracting method, which allows construction to start before project design is complete, saved one construction season, estimated Mike Morrow, field operations engineer with FHWA's Oregon Division. In the Oregon project, the old bridge is the steel truss structure at right, seen after being slid onto temporary piers. The new bridge is at left. The contractor worked six 10-hour days per week from summer 2007 through October to get the bridge up out of the water and avoid working in the river during a critical time for salmon. High-performance concrete-which contains microsilica to make it denser, less permeable and longer-lasting-was used in the bridge decks. 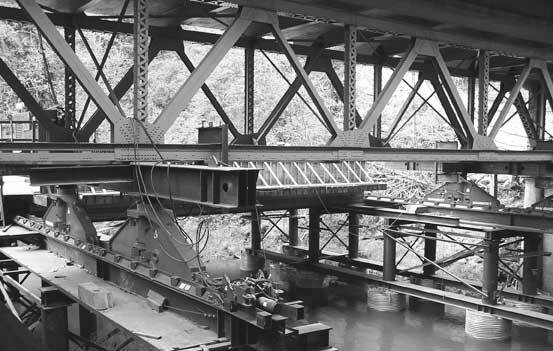 Precast concrete girders for one bridge saved three or four months compared to forming and casting a bridge in place. Drilled shaft foundations saved a couple of months, Reisdorf estimated, compared to placing a cofferdam in the river and installing footings that way. Safety for both workers and the driving public was greatly improved, Reisdorf said, by building the two new bridges out of traffic. “With this method, construction workers were not exposed to traffic," he said. “You have a free flow of traffic for two years, compared to controlling traffic with one-way signalized traffic staging." The use of an innovative A+B+C form of contracting is saving more than a year in the construction of four bridges on South Carolina Highway 377 over the Black River. In support of the construction team's innovations on the $14.25 million project, the South Carolina DOT won a $1 million Highways for LIFE grant. In this case of A+B+C contracting, “A" stands for the contractual bid amount in dollars, “B" is the total project time converted to a dollar figure and “C" is the elapsed time to accomplish a critical milestone, also converted to a dollar figure. The A+B+C method speeds up construction because it builds in monetary rewards for the contractor to apply more resources to the project. All four bridges are being built using staged construction. That means building two-thirds of the new bridges' widths while the old bridges carry traffic. When the partial widths of the new bridges are completed, traffic is switched onto them. The date of that traffic diversion is the critical time “C" in the A+B+C contract. After traffic is switched, the new bridges are completed and the old bridges torn down. “If the contractor meets that diversion milestone or is early, he is paid a substantial incentive, called a no-excuses bonus," said Randy Cannon, project engineer for TRC Engineers, a consulting design firm on the project. “But if the contractor fails to meet that date, he must give up a substantial disincentive in the form of liquidated damages. In fact, the contractor completed that phase early and earned the maximum bonus for doing so." The main bridge of the four is being built in six spans of 60 feet (18.3 meters) each, for a total of 360 feet (109.7 meters). That bridge will have a 44-foot-wide (13.4-meter-wide) roadway consisting of two 12-foot (3.6-meter) travel lanes and two 10-foot (3-meter) shoulders. The other three bridges are called relief bridges because they span over swampy land and are especially needed during periods of high water. The relief bridges consist of 14 spans of 30 feet (9.1 meters) each, for a total of 420 feet (128 meters). The construction team is using another innovation for the prestressed, precast girders in the main bridge. 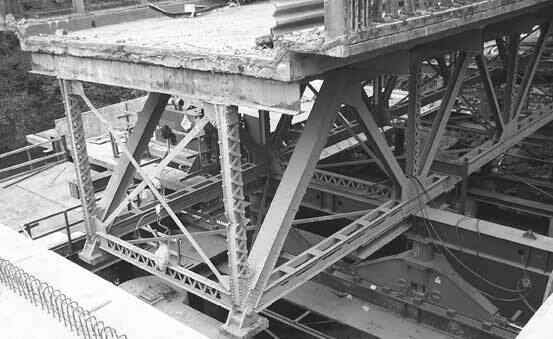 The girders were cast using self-consolidating concrete, which is flowable and can more easily work its way around reinforcing steel than can regular concrete mixes. After testing the strength of a beam with the self-consolidating concrete, the South Carolina DOT decided that it works well and opted to use it. The University of South Carolina has instrumented beams on the bridge with strain gauges and is conducting a research project on the self-consolidating concrete. Cannon said a pavement smoothness specification will be applied to the riding surfaces of the bridges. If the pavement meets the smoothness spec, the contractor will earn an incentive payment. The main bridge has five interior bents and two abutments. The interior bents are founded on drilled shafts, and the end abutments are founded on steel H-piles. For each bent there are three drilled shafts and three concrete columns. For the three relief bridges, flat slabs are being formed and poured in typical 120-foot (36.5-meter) continuous lengths. Nine precast concrete piles make up one bent. The bents supporting the bridge are spaced at 30-foot (9.1-meter) intervals. Innovative construction techniques and complete road closures greatly reduced construction time this summer for two single-span rural bridges, one on Maryland Highway 450 and the other on Maryland Highway 28. Working under a single $3.5-million contract, Concrete General Inc., of Gaithersburg, Md., is tearing out the old bridges and replacing them in just 67 days, said Jeff Robert, project manager for the Maryland State Highway Administration. The Maryland SHA won an $800,000 grant from the Highways for LIFE program to support its innovations in constructing the two bridges. Precast, prestressed concrete deck slabs-constructed offsite-will help speed construction of the superstructures once the old bridges are removed and the foundations are in place. The two bridges each will receive a cast-in-place concrete wearing surface. 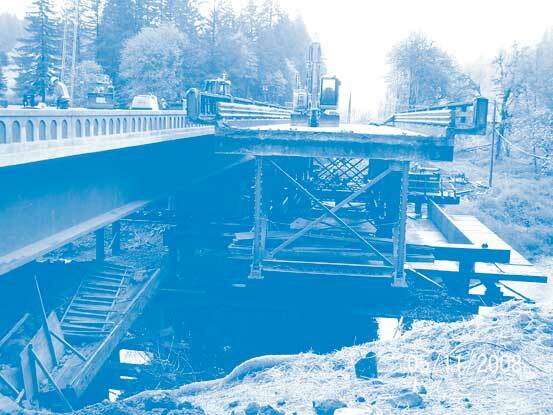 After hydraulic jacks raised up the old bridge on the Oregon project, it was slid sideways onto temporary piers. “If you built the bridges with steel beams and a cast-in-place deck, which has to be formed, filled with reinforcing steel and then poured, it would take at least three more weeks to build each bridge," said Robert. “But with the precast slabs, you can place them all in a day, pour your wearing surface, let it cure for seven days, and you're good to go." By doing the two precast bridges at once, the Maryland SHA can realize some economies of scale. The precast slabs are the same width for both bridges, for example. “We tried to make them as similar as possible," said Robert. The traveling public will realize a major benefit because the state is avoiding a partial road closure to build the bridge. A partial road closure would require traffic to use one lane at alternating times while the other lane is closed for construction. Traffic will need to use a detour during construction-but only for 67 days. “We sold the detour by promising that we could complete both bridges in 67 days-during the summer while school is closed," said Robert. “We said we could get in and get out quickly and the local stakeholders seemed to buy into that." Another innovation being used for the two bridges is the incentive and disincentive system for early or late completion by the contractor. Concrete General can win a $9,000 incentive payment for each day early that the firm finishes ahead of the 67 days-up to a $63,000 maximum. By the same token, for each day late that construction runs, the contractor will be assessed a disincentive of $9,000, with no maximum amount. The goal is to have both bridges open to traffic by the beginning of the school year. For more information on the Highways for LIFE projects in Minnesota, Georgia and Utah, see the October 2007, December 2007 and April 2008 issues of Innovator at www.fhwa.dot.gov/innovation/innovator. Participants cite setting performance goals and learning about innovations other states have used successfully as benefits of attending a “Seeking the Best Solutions" workshop. They also like the opportunity to brainstorm with colleagues and industry experts about new ways to solve their agencies' biggest challenges. Those are among attendees' comments at the first seven workshops conducted by the Highways for LIFE team. The one-day workshops show transportation agencies how to develop a process for setting customer-focused performance goals and identifying the best ways to achieve those goals. “The workshop creates an environment, away from day-to-day office distractions, that enables professionals from many areas of the agency to come together to look at what they need to accomplish and figure out the best ways to do it," said Byron Lord, team leader for Highways for LIFE, the Federal Highway Administration initiative to accelerate innovation deployment in the highway industry. Each workshop is customized and includes participants from the state highway agency, FHWA and, in some cases, industry. Most focus on a specific construction project. “We like to build the workshop around a real project or challenge that the agency is working on that it needs to find better solutions for," Lord said. Participants leave knowing key project delivery strategies, including how to identify highway user and agency priorities, set goals that are challenging but achievable, seek proven innovative solutions to reach those goals and use performance contracting to get the results the agency needs. “I was impressed with the way the workshop was conducted," said Rodger Rochelle, state alternative delivery engineer for the North Carolina Department of Transportation. “It validated a lot of the things we're already doing and gave us ideas for what we ought to be doing. Cross-cutting teams, for instance. The workshop really encouraged a multidisciplinary approach to problem-solving and goal-setting." Rochelle also liked the workshop's SMART approach to setting goals that are specific, measureable, achievable, results-oriented and timely. “That's something we've taken from the workshop and plan on implementing across the board," he said. A workshop helped the Massachusetts Highway Department plan a statewide program to reduce the number of structurally deficient bridges. “We focused on accelerated construction technologies and learned some new ideas from other states," said Frank Tramontozzi, the department's chief engineer. “The workshop got us to brainstorm and start thinking about performance measures. It was beneficial because we knew we had to do things differently to reduce our structurally deficient bridges." A South Dakota workshop emphasized innovative technologies and practices geared to preservation, which the state is emphasizing now, said Ron McMahon, operations and technology team leader in FHWA's South Dakota Division. “I thought it was a good workshop to open our eyes to more technologies," said Mike Behm, assistant director of engineering and planning for the South Dakota DOT. “It was also beneficial to have the FHWA folks there to be able to answer questions and bounce information back and forth quickly." Scheduling a workshop, which FHWA offers at no cost, requires about six weeks' lead time. “We really encourage states to hold a workshop," Lord said. “We'll work with them to customize it to meet their needs and help them find the best solutions for the challenges they face." To schedule a workshop, contact Mary Huie at (202) 366-3039 or mary.huie@dot.gov. Photograph of road crew lowering precast panel into place on a highway. The Federal Highway Administration is offering a free DVD on precast concrete pavement systems, an alternative to cast-in-place construction in which panels are cast offsite and installed quickly when traffic volume is low. A compilation of presentations by industry experts, the DVD introduces precast concrete pavement system technology and provides an overview of its benefits, including improved quality and performance, accelerated construction and reduced safety risks. 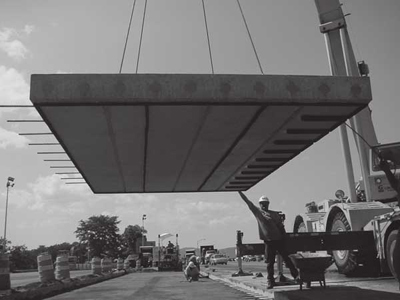 The DVD outlines the technology's applications in areas such as concrete slab replacement, intersections, underpasses, ramps and bridge approach slabs and presents a decision tree to determine when precast concrete pavement systems are applicable. It explains the two main types of systems available and discusses case histories of successful installations. Highway organizations are encouraging use of precast concrete pavement systems to cut construction congestion and enhance safety and quality. FHWA's Highways for LIFE program has named it a “vanguard" technology that it promotes through rapid deployment strategies. It's also one of the focus technologies that the American Association of State Highway and Transportation Officials promotes through a “lead state team" effort. For a copy of the DVD, contact Lizzie Pollock at elizabeth.pollock@dot.gov or (202) 366-0131. The use of innovative construction and contracting techniques was the focus of a May product demonstration showcase at a Highways for LIFE project under construction in Georgia. About 50 transportation professionals turned out to learn about the prefabricated bridge elements, design-build innovations and contractor performance incentives used in building a new Interstate 85 interchange near LaGrange. At the Georgia Highways for LIFE project showcase, workers place a template on the piers to ensure connections will align with the setting of the pier cap. The Georgia Department of Transportation is combining the techniques to speed construction on the $80.9 million project, which includes frontage roads and two bridges. The project received a Federal Highway Administration grant for its use of innovation. At the showcase, Georgia DOT engineers gave presentations highlighting the benefits of using and combining the techniques. Attendees also went on a field trip to the construction site to see the technologies in action. Design-build contracting involves contracting both design and construction to a single builder, which is cheaper and allows both processes to take place simultaneously. Using prefabricated elements for the bridge, rather than custom design and construction, makes both design and implementation go faster. The Georgia DOT also created incentives for the contractor, based largely on work zone crash removal and safety, to minimize congestion and the project's overall intrusiveness on normal highway traffic. Speed band monitoring was demonstrated during the showcase on a live Web link. By using all of these innovations, the agency expects to cut project construction time by 12 to 18 months. For more information on the showcase, visit www.pdshowcase.org. Have you turned what others consider an innovation into standard practice? The Highways for LIFE team is looking for examples of innovative technologies and processes that highway agencies have made everyday practice for a two-day course on accelerating innovation deployment. “Leap Not Creep: Accelerating the Implementation of Innovation" is designed to provide transportation professionals with the tools to implement innovations quickly and make them part of an agency's standard operating procedures. The National Highway Institute plans to launch it in 2009. “We're developing the course as part of the Highways for LIFE mission to significantly accelerate the adoption of innovation in the highway industry," said Kathleen Bergeron, marketing communications coordinator for the Federal Highway Administration program. The course will cover the features of successful deployments, components of a deployment plan, resources for locating innovations and funding for implementation, and strategies for overcoming barriers to innovation. The course will include examples of innovations that have moved from state of the art to state of the practice in highway agencies. Many states, for instance, reduce crashes with rumble strips, patterns of milled depressions on the roadway shoulder or centerline that warn drivers that they've strayed from the driving lane. And some states enhance intersection safety with roundabouts, circular intersections in which traffic flows around a center island. “We have some good case studies already, but we'd like to be able to include more from our agency colleagues around the country," Bergeron said. “Course participants can learn a lot from following the progress of an innovation from identifying a need to trying something new to making it mainstream." Roundabouts-one-way circular intersections in which traffic flows around a center island-enhance safety and reduce congestion, making them an attractive alternative to traditional intersection traffic control. Roundabouts boost safety and reduce congestion at intersections by eliminating many traffic conflicts, slowing vehicle speeds and increasing capacity. Intersection safety has long been a highway community concern. Intersection crashes account for more than 45 percent of all crashes nationwide. Side-impact crashes, which occur mostly at intersections, cause more than one-third of all vehicle occupant deaths. Roundabouts eliminate most of the conflicting traffic-such as left turns-that contribute to crashes at traditional intersections, which are among the most complex traffic situations that motorists encounter. A conventional four-leg intersection has 32 vehicle-to-vehicle conflict points, while a single-lane roundabout has eight conflict points. Roundabouts also promote slower traffic speeds, allowing drivers more time to avoid conflicts and reducing the severity of crashes that do occur. Because they allow for continuous traffic flow, roundabouts increase traffic capacity by about 20 percent over conventional intersections. That can cut down on traffic queues and delays resulting from traffic signals and stop signs. Roundabouts fit the Highways for LIFE initiative's focus on encouraging adoption of innovations that enhance safety and reduce congestion. Roundabouts at six major intersections are part of a reconstruction project on State Route 179 near Sedona, Ariz., that received a Highways for LIFE grant for its use of innovative construction and contracting methods. Roundabout in the United States showing traffic including a school bus. Entering traffic yields to circulating traffic. The “yield-at-entry" rule prevents roundabouts from locking up by allowing vehicles to enter the intersection only when there are gaps in the traffic. Geometric constraints slow down traffic. The curve of the circular road and the angles of entry defined by islands or lane striping slow vehicle speeds to 25 miles per hour (40 kilometers per hour) or less. The Federal Highway Administration recommends roundabouts for intersections where congestion and safety are a concern and traffic capacity and space requirements are met. Roundabouts must be designed to meet the needs of all road users, including drivers, pedestrians and bicyclists. Modern roundabouts were developed in the United Kingdom in the 1950s to address congestion and high crash rates at high-speed traffic circles and rotaries. They've been used successfully all over the world, and more than 1,400 are in operation in the United States. Several states have more than a decade of experience with roundabout performance, including California, Colorado, Florida, Maryland, Nevada and Vermont. Research shows that roundabouts can be safe and effective. A 2000 Insurance Institute for Highway Safety study found that roundabouts can reduce crashes by 39 percent, injury-producing crashes by 76 percent and fatal crashes by 90 percent. 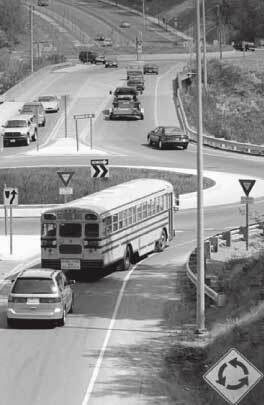 A 2002 Maryland State Highway Administration study found that the overall crash rate was cut by 60 percent and the injury crash rate fell 82 percent at 15 intersections where traditional intersections were replaced by roundabouts. An Insurance Institute survey that focused on motorists, who often say they don't like roundabouts, found that twice as many drivers favored roundabouts after they were installed than before. Those who opposed roundabouts cited concerns about safety or confusion at the new intersections. Some highway agencies are developing resources to address road users' questions about roundabouts. The Maryland State Highway Administration created a “How to Use a Roundabout" Web page at http://www.roads.maryland.gov/Index.aspx?PageId=287, with tips for drivers, bicyclists and walkers. For more information on roundabouts, visit http://safety.fhwa.dot.gov/intersection/innovative/roundabouts/. It includes a link to Roundabouts: An Informational Guide (FHWA-RD-00-67), a comprehensive source on roundabouts with chapters on policy, planning, operation, safety, geometric design, traffic design and landscaping, and system considerations. The FHWA Resource Center offers technical assistance and a workshop on planning and designing roundabout intersections. Among the workshop topics covered are distinguishing modern roundabouts from other types of circular intersections, roundabout geometric design principles, assessing traffic operations at a roundabout, and public education strategies. For more information, contact Mark Doctor at (404) 562-3732 or mark.doctor@dot.gov. The National Cooperative Highway Research Program's Report 572: Roundabouts in the United States explores methods of estimating the safety and operational impact of roundabouts and examines updated design criteria for roundabouts. To access online, go to http://www.trb.org/Main/Public/Blurbs/158299.aspx. The “Modern Roundabouts" website at http://roundabout.kittelson.com/ includes a searchable database of operating and planned roundabouts, as well as a bibliography of articles, books, design guides and videotapes on roundabouts. The Federal Highway Administration is seeking applications for a second round of grants under the Highways for LIFE Technology Partnerships Program. August 28, 2008, is the deadline for submitting applications for grants, which are designed to fund proven prototypes that require additional development and evaluation before they are ready for routine use in highway design, construction or operations. FHWA plans to award $1 million through this round of grants, which will range from $200,000 to $500,000 each. “The Technology Partnership Program provides a way for private organizations and companies to further develop promising innovations and partner with transportation agencies to test them in real-world settings,” said Technology Partnerships Program Coordinator Julie Zirlin. “Through the program, we hope to get innovations on the market sooner so that the highway community and, ultimately, drivers can benefit." To be eligible for consideration, an innovation must make a significant contribution to achieving at least one of the goals of the Highways for LIFE initiative: improving project or work zone safety, reducing construction congestion, accelerating construction or improving quality. Applicable innovation areas include technologies, materials, tools, equipment, procedures, specifications, methodologies, processes or practices used in financing, designing or constructing highways or bridges. Competition for grants is open to all nonprofit and for-profit organizations except state and local governments and institutions of higher education, which are encouraged to participate as partners with awardees. For information on applying for a grant, contact Julie Zirlin at (202) 366-9105 or Julie.Zirlin@dot.gov, or visit /hfl/partnerships/.